Weekday prices (from the resort’s Web site) range from about $210 per night for a standard room to $800 per night for a one-bedroom villa. Our bargain rate was $55 per night, plus taxes and surcharges, from priceline.com for a standard room. Lured by a bargain-basement online rate on a resort hotel room, my husband and I decided to spend a few days celebrating our anniversary in the desert oasis of Indian Wells. It is only an hour and a half drive from our home in Rancho Cucamonga. 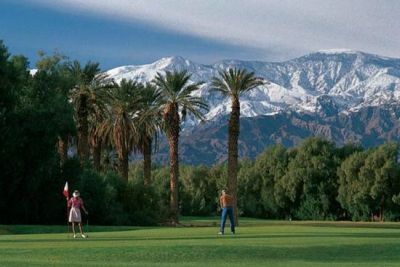 Indian Wells is a close neighbor to the famed celebrity hideaway of Palm Springs. The area is known for its world-class tennis and golf facilities, as well as many resorts and fine dining spots. The straight-shot drive down the 10 Freeway was an easy one, and we arrived in mid-afternoon on a Sunday at the Hyatt Grand Champions Resort, Villas and Spa. Our spacious room featured a step-down sitting area, a flat-screen TV and stone tile in the bathroom. After enjoying a late lunch at a local seafood restaurant, we returned to explore the expansive grounds of the hotel. The grounds, rich with palm trees, include seven pools, several restaurants, a 36-hole golf course and tennis courts. That evening we took in a movie at The River at Rancho Mirage shopping center, a short six-mile drive from our hotel. The shopping center’s outdoor ambiance was reminiscent of Pasadena’s Paseo Colorado, highlighted by a large man-made waterfront with fountains. Live music filled the air as we strolled. The next day, our anniversary, we went out for breakfast at a nearby IHOP. We decided not to go to any of the resort’s restaurants during our stay, as we concluded the price would not be worth the convenience. After breakfast, I headed to the resort’s spa, the Agua Serena, for a few hours of pampering. I started with a facial, followed by a massage and a manicure. The staff was knowledgeable and extremely friendly, and the environment was peaceful and serene. After my treatments I met my husband at one of the pools, the Oasis Pool, which is reserved for guests 18 and older. (We had left our two small children in the capable hands of my in-laws for our getaway … families traveling with children have their pick of several other pools in the complex, including one with a waterslide). One unique feature of the Oasis was the opportunity to rent (for a fee) a private poolside cabana, which we did for a half-day (four hours). The cozy, covered nooks included plush lounge chairs, a ceiling fan and cool-water mister, a small fridge stocked with bottled water and fresh fruit, and a television. Staff came to the cabana periodically to take orders for, and deliver, (pricey) cocktails and food. We ended up getting our money’s worth, lazily using the cabana for the full four-hour time slot. Our anniversary dinner was spent at LG’s Prime Steakhouse in the neighboring town of La Quinta. The food, ambience and service were good, not great, and the price tag was steep. The next morning we headed for home, stopping first about 20 miles west of Indian Wells for a little shopping at the outlet mall in Cabazon. We returned home with our batteries recharged and we’d like to visit the area again. Next time we’ll plan on being a little more active, maybe with a hike at Joshua Tree National Park and a trip up the Palm Springs Aerial Tramway. “Discover More Of Hawaii For Less Than You Imagined,” the Hawaii Visitors and Convention Bureau has launched a winter vacation campaign offering travel packages to the Hawaiian Islands at deeply discounted savings. Recognizing that travelers in this economic environment are seeking incredible experiences unique to a destination, but at a great value, the visitors bureau has introduced a new website – GoHawaii.com/Value – listing the Hawaii vacation deals. Visitors are encouraged to check back frequently to view updates and new offers as they become available. Travel wholesalers offering the packages are Pleasant Holidays, Travelocity, Expedia, Orbitz, All About HAWAII, Blue Sky Tours, LibGO Travel, Travel Impressions, Classic Vacations, MLT Vacations, Funjet Vacations, United Vacations, Hawaii Connection, and American Airlines Vacations. The special deals are good now – with some offers available through first quarter 2009 with various expiration and blackout dates ­– and present a variety of cost-saving air-hotel vacation packages, as well as credits for car rental, and food, and beverage. Consumers can shop around and choose the travel package that best fits their lifestyle and pocketbook. In addition, many individual hotels and airlines are also offering attractively priced rates to draw vacationers to the Hawaiian Islands. Monahan added travelers will find there is ample airlift to the islands. To that end, Delta Air Lines has added additional flights from Los Angeles to Kauai and Hawaii’s Big Island, increasing its Hawaii service. Last month the release of the TNS American Traveler Study showed that Hawaii received the highest scores of all destinations nationwide for visitor satisfaction among travelers who had taken vacations within the past three years. The bureau recently introduced its Stories of Hawaii videos at GoHawaii.com showing Hawaii’s people sharing their insights about the unique appeal of the islands. The most recent video to debut is ‘The Hula of Kauai’ and shows Na Hula O Kaohikukapulani telling the story of the beloved white waters of Waimea, Kauai. For more information about Hawaii, the Islands of Aloha, visit GoHawaii.com. From Oct. 10 through Nov. 19, rates start at $223 at the Ranch and $372 at the Inn. The rate is $199 at the Ranch and $332 at the Inn from Nov. 23 through Dec. 18. Beginning Jan. 1 through Feb. 12, the rate begins at $204 at the Ranch and $338 at the Inn. And from Feb. 13 through Apr. 19, 2009, the package price begins at $262 at the Ranch and $438 at the Inn. Rates are for two people based on double occupancy and do not include taxes. Some blackout dates apply. At 214 feet below sea level, the Furnace Creek Golf Course is the lowest golf course in the world. It has achieved the designation “Certified Audubon Cooperative Sanctuary” from the Audubon Cooperative Sanctuary System (ACSS), the educational division of Audubon International. Because the golf ball does not fly as far as it does at sea level and higher elevation courses, players must adjust their club selections as well as their mental approaches. The course also features small greens, strategically placed Palm and Tamarisk trees and water on nine holes. Originally opened in 1931, the course underwent a major renovation in 1997 under the direction of world-renowned golf course architect Perry Dye. The Furnace Creek Inn & Ranch Resort has been welcoming guests since the 1930s. The AAA Four-Diamond-rated Furnace Creek Inn is open from mid-October through mid-May. It features 66 rooms, including two suites with a full array of amenities, fine dining, tennis courts and a spring-fed pool. Open year-round, the Furnace Creek Ranch is situated adjacent to the golf course and features 224 rooms in a casual setting, general store, spring-fed swimming pool, tennis courts, horseback riding and the Borax Museum. For more information about the Furnace Creek golf course, call the golf shop at 1-760-786-3373. For more information about facilities in Death Valley National Park or to make reservations at in-park lodges, call toll free at 1-800-236-7916 or 1-303-297-2757 or go to www.furnacecreekresort.com. Boo at the Zoo, haunted houses, monster movie marathons, neighborhood festivals from Japantown to the Mission District, and walking tours filled with legend and lore are just part of the frisky Halloween fun brewing in the San Francisco Bay Area. For more autumn fun, visit www.onlyinsanfrancisco.com and check out www.homeforhalloween.com for Halloween event updates. In all cases public transit is recommended; for information, telephone 511 (in the nine San Francisco Bay Area counties) or 510-893-8729 or visit www.511.org. Halloween Haunt is an “in your face” scare experience complete with five mazes, four scare zones, three live stage shows, and one gruesome attraction plus the park’s collection of thrill rides. Event is rated PG-13. Full price admission is $39.99. For information call 408-988-1776 or visit www.pgathrills.com for additional advance savings. It’s thrills by day and chills by night at the annual Halloween Fright Fest. Bring the little ones in the daytime for trick-or-treating and kid-friendly fun. Because when the sun goes down, it’s not for the faint of heart. Six Flags Discovery Kingdom morphs into a shadow land of ghosts and ghouls. Roller coasters become monstrosities in motion, and scares await at every turn. Fright Fest takes place every weekend Oct. 4-Nov. 2 and Fridays, Oct. 24 and Oct. 31. See the park eerily transformed from coaster to coaster, venture through haunted mazes and themed scare zones plus, trick or treat with Bugs Bunny and friends. For information and hours of operation, visit www.sixflags.com or call 707-644-4000. Castro Theatre, 429 Castro St. This two-day horror film festival features classic (and not so classic) cinematic chillers. This year’s fearsome film lineup includes “Whatever Happened to Spider Baby” and “Night of the Living Dead.” Ghoulish guests of honor include Kathryn Leigh Scott and Lara Parker from “Dark Shadows.” For information call 415-621-6120 or visit www.castrotheatre.com or www.shock-it-to-me.com. The Physics of Toys team gets into the spooky spirit with toys that ooze, screech and scare! Make slime, screeching balloons and other gruesome gadgets. Physics of Toys is included in the price of admission to the Exploratorium. Take home what you make. All materials provided. For information visit www.exploratorium.edu or call 415-EXP-LORE (397-5673). Half Moon Bay, the “World Pumpkin Capital,” celebrates its bountiful fall harvest with a wicked and delicious lineup of rustic pumpkin patches, harvest-inspired crafts, home-style foods, expert pumpkin carvers, the Great Pumpkin Parade with Grand Marshal Will Clark, a bone-chilling Haunted House, titanic weigh-off champion pumpkins, pie-eating, carving and costume contests, pancake breakfast, 5 and 10k run/walk, and three stages of blockbuster entertainment. Admission is free. For information call 650-726-9652 or visit www.miramarevents.com. An annual family-oriented fundraiser features Halloween excitement with games, decorations, train rides, live entertainment, and, of course, trick-or-treats. Attend witches school, visit the petting zoo, ride a pony and enjoy a full brew of games, including Boo Bowling, and activities. $14 per person, ages one and above. For information call 415-339-3900 or visit www.baykidsmuseum.org. This one takes the pumpkin. Special flashlight tours ($43 per person) are offered on Oct. 18, 25 and 31 and every Friday the 13th. Tour the rambling mansion with only the moonlight, a souvenir flashlight and your imagination to guide you through a bewildering maze of rooms and stairways. For Halloween, there’s also special entertainment and trick-or-treating in the gardens for the whole family. For information, call 408-247-2000 or visit www.winchestermysteryhouse.com. Candy factory tours include the fun and kid-friendly Halloween Swamp at the Jelly Belly Candy Company. Tours detour through a decorated haven of Halloween delights; see the making of jelly beans, candy corn, gummi spiders and more on 40-minute tours. Samples for all. For information, call 800-953-5592 or visit www.jellybelly.com. This fundraiser for the California Academy of Sciences is $350 per family (two adults plus up to two children), $100 each additional adult ticket, $75 per each additional child ticket. The greenest scene this Halloween will be inside the new Academy, from the rainforest to the ocean deep. Enjoy “spooktacular” activities, entertainment, crafts and fun for the entire family and have face-to-face encounters with Academy scientists and their creepy, crawly collection. Delicious food and creative entertainment will delight kids of all ages. For tickets call 415-379-5404 or visit www.calacademy.org. One of San Francisco’s newest Halloween traditions features casino games with celebrity dealers. Presented by the Stop AIDS project and Elbow Grease, the event includes dancing, performances, silent auction and a free glass of wine for everyone who comes in costume. Ticket levels start at $50 per person. To order tickets visit www.stopaids.org or call 415-575-0150, ext. 260. Napa’s local lounge lizard, Will the Thrill, and his lovely assistant, Monica Tiki Goddess, return for COPIA Halloween and a viewing of 1959 film “Frankenstein Meets the Space Monster.” Napa Valley’s The Maikai Gents, TV horror host Mr. Lobo and his Amazonian assistant, The Queen of Trash, add to the fun. $7 admission. For information visit www.copia.org or call 707-259-1600. The Regency Center, 1290 Sutter St.
Three floors of Halloween fun for ages 21 and over. Ten DJs and six venues in one; the Grand Ballroom features Trevor Simpson of 92.7, an 11-piece Latin salsa band will hold forth in the Latin Room, DJ Big Bad Bruce will bring back the ’70s and ’80s and there will be costume contests in all rooms with great prizes. For more information, call 415-673-6464 or 415-260-9920 or visit www.alfandalf.com or www.aykutevents.com. Come in costume and join in the kid-friendly festivities at the Randall Museum’s Family Halloween Day. The Museum will be transformed into a Halloween haunt with a gamut of ghoulish games, creepy crafts, tricks and treats, pumpkins and more. Entertainment includes Jackie Jones playing the saw with her amazing dancing cat. Kids, ages 2-12, and their families; must be accompanied by an adult. Admission is free; low cost activities. For information call 415-554-9600 or visit www.randallmuseum.org. Little ghouls and goblins 10 and under will be right at home at the Jelly Belly Visitor Center; it’s everyone in costume for the Munchkin Masquerade march through the Halloween Swamp in the candy factory tour. Face painting, clowns and treats for kids add to the fun. For information, call 800-953-5592 or visit www.jellybelly.com. Just in time for Halloween, come aboard for a Halloween family cruise to enjoy chills and thrills on this fun, 90-minute costume party cruise for families on San Francisco Bay. Take part in a costume contest, enjoy delicious sweets, and marvel about the magnificent sights that San Francisco Bay has to offer. Non-alcoholic beverages will be available for purchase. Adults $28; children ages 5-17, $18. To reserve space visit www.redandwhite.com or call 415-673-2900. Special five-mile, relatively flat, dusk-to-night hike is in search of two inhabitants — the coyote and great horned owl — whose nightly sounds haunt many human visitors. Along the way, learn more about the secret lives of these reclusive characters. Free. Meet at Tennessee Valley trailhead. For reservations, call 415-331-1540 or visit www.parksconservancy.org. call 510-521-8448, ext. 282 or visit www.hornetevents.com. Boarding begins at 8:30 p.m.; boat departs at 9:30 p.m.
Join 98.1 KISS-FM and Hornblower Cruises for the second annual KISS Screamin’ Halloween Cruise. Come dressed to trick or treat and then jive to KISS-FM tunes until the clock strikes midnight. Tasty cocktails, delicious appetizers and stunning views make for a frighteningly good time. Tickets $38.30; gratuity, service and tax additional. For information call 888-467-6256 or visit www.hornblower.com. San Francisco Zoo, One Zoo Road, Great Highway and Sloat Blvd. Looking for an “un-boo-lievably” wild way to celebrate Halloween? Make plans to join the animals for two days of not-so-scary, high-spirited Halloween fun at Boo at the Zoo. Costumed kids and their families will have a howling good time encountering animals on the Haunted Nature Trail and thrills and chills visiting the Creepy Crawley Critters in the Insect Zoo. Make sure to check out the “Stomp and Chomp” animal enrichments when chimps, gorillas, lions, meerkats and more get to devour their pumpkins filled with treats. Kids will also enjoy free trick-or-treat stations all over the Zoo. Bring your family and friends for two days of big fun at Boo at the Zoo! The daytime event takes place rain or shine and is free with paid Zoo admission. For information call 415-753-7080 or visit www.sfzoo.org. 11 a.m.-5 p.m.; Haunted House open Oct. 25-26 and Nov. 1-2 11 a.m.-5 p.m. and Oct. 29-31 1-5 p.m.
Zeum, San Francisco’s hands-on multimedia museum for kids, is celebrating its 10th anniversary with a week-long Halloween Haunted House experience opening with a free day on Saturday, Oct. 25, and continuing through Sunday, Nov. 2. The free day Oct. 25 will be a Halloween Birthday Bash including birthday cake and a trick-or-treating parade. Kids will also be able create spooky videos and animations, show off and win prizes for their costumes and enter a raffle for a free birthday party at Zeum and other prizes. Throughout the week, the Haunted House will be free with admission. Additional events for Zeum’s 10th anniversary include a Dia de Los Muertos Party Nov. 1, 12:30-2:30 p.m.; free gift for 10-year-olds with proof of age and inclusion in Zeum’s “10-Year-Old Celebrities” wall. Admission is $8 youth; $8 seniors and students; $10 adults; free for visitors age 2 and younger. For information call 415-820-3320 or visit www.zeum.org. Bring the whole family and a pumpkin or two to paint, carve and decorate and share some Halloween folklore and recipes that are truly scary. Reservations required. Free. For information call 415-331-1540 or visit www.parksconservancy.org. Hosted by the Unique Derique and featuring live music, children under 10 and their families are invited to parade around in Halloween finery. The Costume Walk also features performances and interactive games for kids. Kids in costume and their parents receive free admission to Zeum’s Haunted House experience. For information call 415-543-1718 or visit www.ybgf.org. Ghoulish and giddy behavior is part of the fun as kids in costume trick or treat throughout PIER 39’s Pumpkin Pandemonium. Children 12 and under are welcome to visit the shops, restaurants and attractions to gather their sweets. Pumpkin carving demonstrations, and face painting will be available, as well as photos with frightful characters and an ’80s Halloween show, “It’s Like Halloween.” Children will be able to wander through the pumpkin patch to pick their one free pumpkin. For information, call 415-705-5500 or visit www.pier39.com. Ruby Skye, 420 Mason St.
Dance the night away at Fresh’s (www.freshsf.com) special Halloween T-Dance at Ruby Skye (www.rubyskye.com). DJ Phil B. will be working his usual magic. Restricted to ages 21 and over. The Exploratorium, Palace of Fine Arts, 3601 Lyon St. The Exploratorium partners with the Wender Weis Foundation for Children (WWFC) for their annual Halloween Heroes event. The museum will be transformed into a cool Halloween headquarters with hands-on science and art activities, celebrity athletes and media personalities, food and drink donated by top Bay Area restaurants, costumed characters, face painting, pumpkin carving, trick-or-treat stations and more. Tickets are $185 per adult plus one child under 18; $350 per couple plus two children under 18; $55 additional child 3-17; children 3 and under will be admitted free of charge; other options available. For information or to purchase tickets, visit www.wenderweis.org. Wax Museum at Fisherman’s Wharf, 165 Jefferson St. The Wax Museum of Fisherman’s Wharf, noted for more than 200 life-sized figures staged in elaborate scenes with costumes, props and lighting, may be the only place in San Francisco where one can actually party with ghosts. Outrageous costumes are encouraged. Advance tickets $80, $100 at the door, include hosted bar and “Frankenstein Franks.” For information and to purchase tickets, visit www.waxmuseum.com/halloween. The year-long series of environmentally-focused educational activities and events for children sponsored by Oracle will incorporate a Halloween theme; craft activities include pumpkin decorating, the history and facts about pumpkins and Halloween. With kid-safe carving tools, stickers and paints, parents and children will create pumpkin art and monster puppets from paper bags. The Ghost Story Theatre will feature a shared activity with guides crafting and performing spooky stories. Little visitors will be assisted with face painting to prepare for the yearly Halloween costume walk at Yerba Buena Gardens. For information call 415-543-1718 or visit www.ybgf.org. Help save lives and have a spooky good time. All blood donors will have their name entered to win a Nintendo Wii, hotel and restaurant gift certificates, and much more. Enjoy treats and goodie bags as well. Donor coach will be located at Drumm Street between Three and Four Embarcadero Center. Donors can sign up for appointments at www.bloodheroes.com, enter embarcadero as the sponsor code (case sensitive). For more information call the Tenant Relations hotline at 415-772-0730 or email bmendoza@bostonproperties.com. Help “eco-pirates” pick up trash, clean up the park and recycle. This fun-filled program focuses on ways families can explore San Francisco’s National Park and keep it beautiful as well. $12 per child with pre-registration; $15 at the door. For reservations call 415-561-7752 or visit www.parksconservancy.org. The Cannery at Del Monte Square, 2801 Leavenworth St.
Musical entertainment begins at 11:45 a.m. For information call 415-771-3112 or visit www.thecannery.com. Halloween, sometimes called the Gay Christmas, takes on a decidedly different look for 2008 with an event planned for Parking Lot A, an open space south of Market near the ballpark. Plans include a family-friendly celebration from 4-8 p.m., complete with costume and pie-eating contests, followed by entertainment featuring local musicians and performers beginning at 8 p.m. Admission is free and open to the public. Smaller neighborhood celebrations will take place at clubs and businesses all over the City, as reflected in the City-sponsored campaign, Home for Halloween. At the heart of the LGBT community, the Castro, bars and restaurants will be open. However, streets will not be closed and traffic will flow normally. Guests are welcomed to dress up and join in celebrating San Francisco’s diversity and creativity while supporting local businesses and respecting the surrounding neighborhood. For information visit www.homeforhalloween.com. Children of all ages are invited to enjoy the magic of Halloween in a safe and sane environment. All trick- or-treaters will receive candy and other treats from participating merchants. For information visit www.broadwayplaza.com or call 925-939-7600. Presidio of San Francisco, corner of Lincoln Blvd. and Funston Ave.
Take a walk on the wild side with spine-tingling tales of the Presidio’s history. Dress warmly, wear comfortable shoes and bring a flashlight (optional) for this unforgettable Halloween park adventure. Meet park rangers Penn and Colindres at the corner of Lincoln Boulevard and Funston Avenue for a moderate, one-mile walk. For reservations (required), call 415-561-4323 or visit www.parksconservancy.org. Enjoy Mexican hot chocolate and Day of the Dead bread at the Officers Club, 50 Moraga Ave., for $5; to pre-order call 415-561-2805. Japanese Community and Cultural Center of Northern California (JCCNC), 1840 Sutter St.
Come to JCCCNC’s and the Japanese Community Youth Council’s Halloween Carnival for a safe spooky scene. Indoors arts and crafts, games, a trick or treat parade and a jumper are part of the fun. Also featured this year will be an all-new Mad Scientist Lab with hands-on experiments for kids of all ages. Space is limited. $3 per person at the door. For information call 415-567-5505 ext. 239 or visit http://www.jcccnc.org. The Exploratorim will be transformed into a Phantasmagorium of spooky science and frightful fun. In the first annual Halloween fright night, the Exploratorium digs six feet under the cultural and scientific phenomena behind Halloween, Dia de los Muertos and death. Find out how nature deals with death and regeneration with a decomposing snake at the Energy from Death exhibit. Get sucked into the finer points of leech science with nurses (in costume, but for real) from the Association of periOperative Registered Nurses (AORN). Walk through a “graveyard” dedicated to debunked science ideas, including the recently entombed Pluto is a Planet (1930 – 2006). Witness the Iron Science Teacher competition where teachers compete before a live audience, or catch a sugar skull candy-making demonstration with master confectioner Irma Ortiz, among other events. Included in the price of admission to the Exploratorium. For information visit www.exploratorium.edu or call 415-EXP-LORE (397-5673). Teatro ZinZanni will host a special Halloween evening performance full of ghoulish love and chaotic decadence. Audiences are invited to dress up in their favorite costumes and join the Macabre Ball at Teatro ZinZombie. This promises to be a memorable evening that includes a costume parade and prizes to the top three costumes judged by Teatro ZinZanni’s spectacular cast members. For tickets, call 415-438.2668 or visit www.zinzanni.org. Davies Symphony Hall, 201 Van Ness Ave.
Relive the golden days of early cinema with Lon Chaney in his classic role in “The Phantom of the Opera” (1925). The live musical accompaniment to this gem of the silent film era comes from our majestic, 9,000-pipe Ruffatti organ, the largest concert hall organ in North America. Prices start at $25; half-price for ages 12 and under. For ticket information visit www.sfsymphony.org or call 415-864-6000. The San Francisco Jazz Festival presents the rhythms of DJ Spooky and Forro in the Dark for this Halloween party with a downtown NYC twist. DJ Spooky (Paul Miller) is a composer, multimedia artist, writer and DJ who has remixed artists from Wu-Tang Clan to Metallica and rocked parties, clubs and festivals and opera houses worldwide. For information visit www.sfjazz.org or call 866-902-JAZZ (5299). Friday 6 p.m.-Saturday 10 a.m. This Halloween-themed version of the Zoo’s popular overnight program invites families for a nocturnal safari, pumpkin carving, keeper talk, comfy indoor camping, a continental breakfast and an exciting morning challenge for the whole family. Children must be six years old and accompanied by an adult. For groups of 30 or more, call to schedule your overnight. Fee for members $65 for children 6-12 years old and $75 for adults; all others $75 and $85. Pre-registration required. For information call 415-753-8124 or visit www.sfzoo.org. True Fiction Magazine returns to the Bayfront Theatre for its annual Halloween shows. The renowned ensemble creates a night of intersecting stories from a single suggestion from the audience. For information call 415-474-6776 or visit www.improv.org. Experience two nights of Halloween fun as Ruby Skye is transformed into the dark fantasy world of Gotham City with more than $20,000 in props and dcor. For information on ticketing, dress code and hours call 415-693-0777 or visit www.rubyskye.com. Evergreen Lodge has added three new guided fall tours of Yosemite to its recreation program. Guests heading to the historic lodge to experience Yosemite also now have expanded spa services available to them to completely unwind. 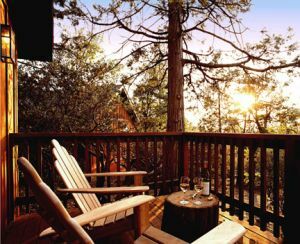 Located on the western border of Yosemite Park near the Hetch Hetchy Valley, the Evergreen is a serene Yosemite destination that blends the modern comforts of a resort, the relaxed approach and activities of a dude ranch and the timeless warmth of a historic 1920s lodge. The Evergreen is the only Yosemite lodge with its own guide service and a recreation program that has expanded to be the most comprehensive in the area since new owners took over the lodge in 2002. Co-owner Dan Braun, a Yosemite expert with over 30 years of wilderness experience and 10,000 trail miles logged, developed the outdoor adventure activities. Given its moderate elevation, the Evergreen offers a variety of activities well into the winter season. The lodge’s fall and winter activities offer guests a rare opportunity to experience the famous valley and surrounding peaks in their seasonal splendor. Private Guided Photography Workshop and Tour is led by renowned Yosemite photographer and naturalist Rob Hirsch in half- or full-day sessions for up to three people. Half Dome Journey, one of Yosemite’s ultimate adventures, is a challenging, one-of-a-kind 17-mile hike to the top of Half Dome and back. Offered September to October. Cloud’s Rest by way of Sunset Trail is the featured October hike and takes guests to the high country to one of John Muir’s favorite places in Yosemite. Fall Bike & Hike to Rainbow Pools or Granite Gorge takes bike riders along Yosemite back roads then on a gentle hike along the pristine Tuolumne River to Granite Gorge or the historic Rainbow Pools. Offered October to November. Range of Light Yosemite Valley Naturalist Tour is a sightseeing van tour of the unforgettable Sierra Nevadas John Muir called the “Range of Light.” Offered October to December. Sierra Sunset Hike or Snowshoe leaves right from the lodge to view wildlife, old-growth forest and vistas down the Tuolumne River Canyon. Offered October to May. Wonders of Yosemite Naturalist Tour features both Yosemite Valley and the giant sequoias in a combination van tour and hike/snowshoe. Offered October to May. Fall Valley Explorer Hike & Tour is Evergreen’s most in-depth and intimate look at Yosemite Valley via an old stagecoach route. Offered October to December. The Evergreen’s experienced recreation staff provides advice and guidance for planning customized adventures. They also offer maps and guides and an array of rental equipment such as mountain bikes, mountain strollers, snowshoes, trekking poles and GPS units. Guests may also participate in numerous complimentary activities on site, such as s’mores over the campfire, horseshoe tournaments, kids’ crafts, lectures, live music and more. This year, the Evergreen Lodge expands its massage services with two picturesque locations to choose from. The new open-air cabana in a grove of cedars provides a secluded spot for a massage in nature. The historic log cabin offers a charming indoor option. In-room massages in the privacy of guests’ spacious cabins are also offered for an additional fee. Treatments include Swedish, deep tissue, hot stone, reflexology and sports massage and are available in hour or hour-and-a-half sessions. Prices start at $85. All cabins at the lodge are heated. SIRIUS satellite radio, DVD players and a movie library are also complimentary. Evergreen is popular with couples, families, groups, weddings and corporate retreats. Room rates vary from $89 to $299 depending on the season and type of cabin. For more information about the Evergreen’s recreation program and massage services, visit http://www.evergreenlodge.com/, call (209) 379-2606 or email info@evergreenlodge.com.